Photinus sp. (Photo: James Jordan, Flicker Sharing). As summer rolls around it's time again for the emergence of fireflies or lightning bugs. These benign insect ambassadors have been many children's introduction to the world of beetles and friendly insects. For today's post I will introduce you to the three most common groups of fireflies in the Eastern US and how you can use LED flash patterns to call the most common species to you. It makes a great lesson plan for evening programs or just something fun to do with the kids on a summer night. 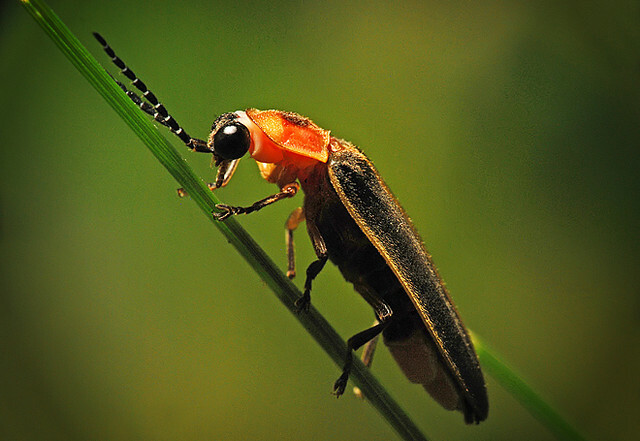 Fireflies, or lightening bugs, are beetles (order Coleoptera). Unlike their cousins, that have hard-bodied elytra (ee-light-tra) or wing coverings. Their bodies and wings are relatively soft and they have leathery wing coverings. The are usually about 2 cm long, and blackish with reddish or yellow spots on their head covering. The head covering is also called the pronotum (pro-know-tum). Around the world, there are over 2,000 species of fireflies, and most live in tropical, moist and damp areas, in part because of their soft bodies. Lightning bugs are called this because their abdomens light up using a chemical process called bioluminescence. In the Eastern US there are three common families of fireflies that we see, Photinus (Foe-tine-us), Pyractomena (Pie-rack-toe-mean-A), and Photuris (Foe-tur-is). You can distinguish them apart by looking at their head covering and their wings. Posted in Insects, Night Time Activities, Science Activites for Kids, Teaching Materials and tagged Call lightning bugs, Fireflies, Lightning bugs, Photinus on June 24, 2014 by Infinite Spider.